I seem to keep buying dark, vampy colours – only to find out that they look nothing but black on my nails. I really need to stop myself! Anyway, #02 from Kiko’s Sparkling Holiday collection of 2018 is deep, vampy, really pretty. The formula is thick and super easy to work with. The coverage is perfect – I used one single coat of polish for my manicure. The drying time is good. The stamp is from the stamping plate “Mezerdoo B4”. 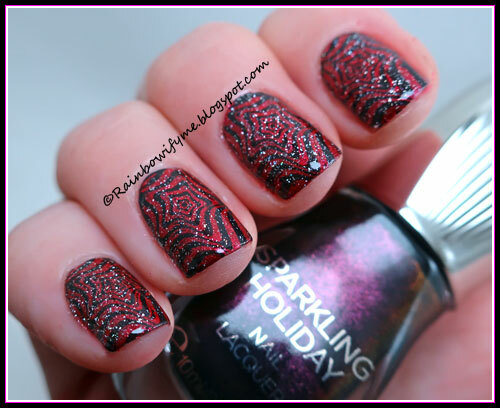 I stamped with Colour Alike’s stamping polish “B. a Red Wine”. I topped the whole thing with El Corazón’s holo flakie topper “421h/25”. 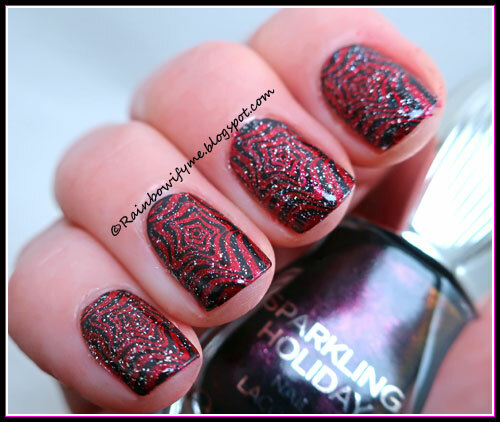 I love the stamping polish, it made up for some of the darkness of the Kiko shimmer polish. Here’s #02 on its own. This is one single coat and a thin layer of topcoat. This is exactly what it looks like in real life. 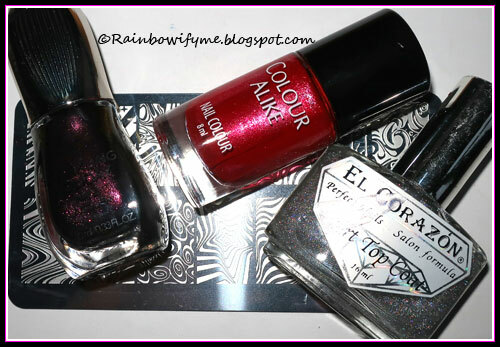 Here are the polishes and the plate I used today. Honestly? This is too dark for me and I’ll have to find it another home soon. What a shame. Overall impression: Good, thick formula, great coverage. The polish is really dark and vampy. I also have some polishes that look nice in a bottle, but black on nails... What a shame.